“It’s quite an achievement to win and be a part of the Best of Philly series. This is a huge accomplishment for Green Pest Solutions and we can’t accept the award without recognizing the importance of superior customer service. We are graciously honored to receive such an elite award, and be looked at as the region’s best pest control provider” says Matt Jesson, President. For 41 years, “Best of Philly” has been the recognized mark of excellence in Philadelphia. Green Pest Solutions’ designation signifies that in the estimation of Philadelphia Magazine’s editors, Green Pest Solutions is the very best at what they do. 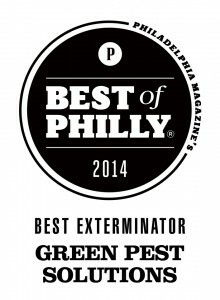 Green Pest Solutions is proud to be included amongst the Philadelphia region’s elite in 2014. Philadelphia area consumers are used to seeing Best of Philly awards for restaurants, recreation centers and salons, so it’s delightful for Green Pest Solutions’ employees to have earned the esteemed regional recognition they deserve for keeping consumer’s homes pest free. Green Pest Solutions isn’t new to these kind of accolades as they were named an Inc. 5000 Fastest Growing Company in 2012 and 2013. The company has also received an excessive amount of online feedback via Angie’s List, Home Advisor, Yelp and Google sites. Green Pest Solutions has now attained over 750+ reviews on online reputation sites!